Chances are, if you’ve ever used a touchpad, fingerprint reader, or tablet device, you’ve connected with Synaptics technology. 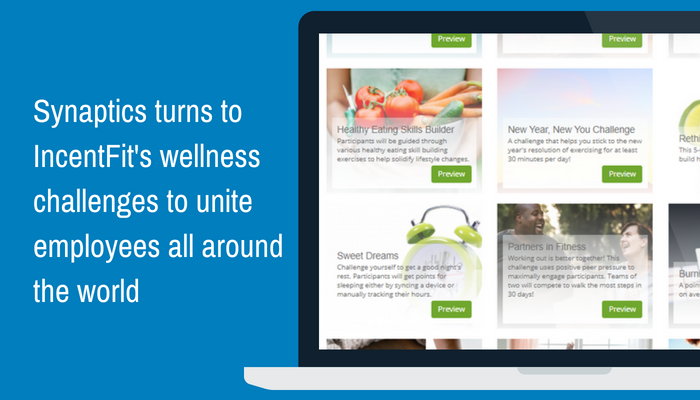 So it makes sense that a company that revolutionized human interface and touch technology would integrate tech into many aspects of work—including its wellness program. Synaptics’ 2,000 employees rely on a cohesive health and wellness program that connects on-site fitness perks, digital resources, and a cadre of engaging wellness challenges administered through IncentFit’s mobile app. 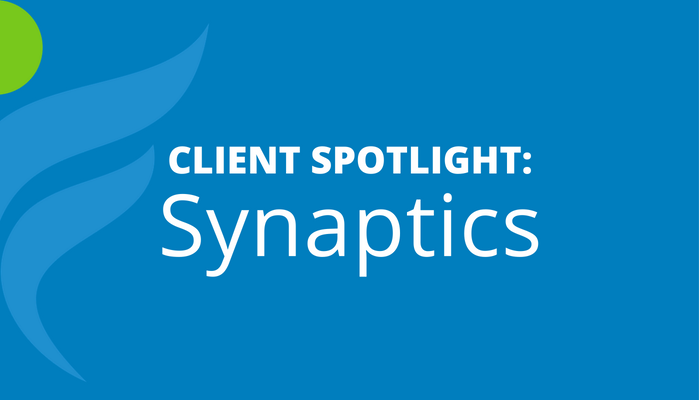 Sam Skelton, Synaptics’ dedicated fitness and wellness program manager, explains that the company’s approach to wellness became more sophisticated with time. Initially, they only had annual biometric screenings and insurance discounts, but within a few years developed this into a full-fledged wellness program. “When I first started here in 2014, it was an emerging thing for employers to provide wellness and I think Synaptics wanted to be on the forefront of that,” says Skelton. In the heart of Silicon Valley, you’ll find the company’s global headquarters in the City of San José, where hundreds of employees work in technology, engineering and product-design. But you might also catch them taking a break to lift weights, practice yoga, or jump into to one of the many free group exercise classes in the tech-enabled fitness center on Synaptics’ campus. At the 24-hour fitness center, which Skelton manages, employees can sign up for personal training, attend classes, or use Apple TV to stream hundreds of wellness videos. Synaptics is a global company, so they turned to IncentFit to bridge the gap between offices. “One of the driving forces for bringing IncentFit on board in the first place was trying to provide a global platform that everyone can participate in. We’re focused on unifying employees as a whole instead of looking at each office individually,” explains Skelton. Synaptics’ 2,000 employees are spread from California to Shanghai, but they stay connected by participating in individual or team-based wellness challenges on IncentFit. Since enrolling in 2014, they’ve run two dozen campaigns, targeting everything from steps taken to ounces of water consumed. With challenges, Synaptics leverages the power of friendly competition to get employees to exercise. They can earn credit for activities they’re already doing–like walking or biking–or get inspired to try something new. “My favorite challenges are the points-based ones where I can design it just the way I want, and include every activity that I think is appropriate,” says Skelton. As the company’s fitness and wellness program manager, he has a hands-on role in designing challenges and promoting them through in-person kickoff events and internal communication. He uses a mix of challenges from IncentFit’s templates gallery and custom options that he creates himself. The most popular to date: a Fall Fitness Challenge. Over the course of a month, 42 teams worldwide worked to earn the most points by completing activities including regular exercise, participating in group fitness classes, watching educational videos, or adding fruits and vegetables to their diets. What really helped it succeed, says Skelton, was kicking off the challenge with an in-person event, a 5k Run/Walk open to all levels and abilities. They’ve also offered fitness trackers or other prizes as incentives, as budget allows. Curious about how challenges could work for your company? Schedule a call with us to learn more about engagaing employees year-round.